SPOILER ALERT:: If you spend your week daydreaming about dragons and your Sunday glued to the couch waiting for nine o’clock, you’re not alone. Now on its seventh season, Game of Thrones has become an icon in today’s society. What a time to be alive! Through death and betrayal, we keep coming back for more. The lessons learned from Game of Thrones aren’t just applicable to life in the Seven Kingdoms, but also in your everyday work life. We laugh, we cry, and we swear we will stop watching if Tyrion is next to die, but it’s foremost a show about human interaction and we don’t ever want it to end. 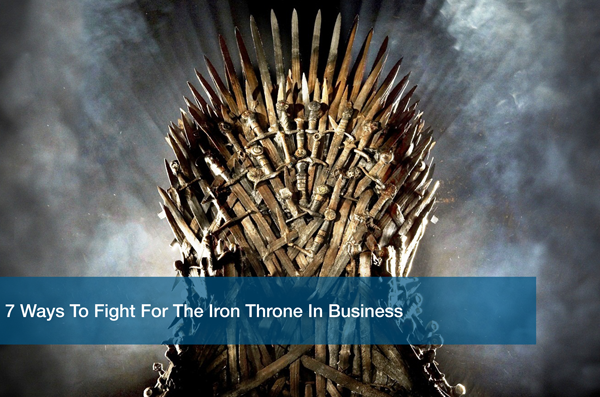 Here are seven things we have learned in business after watching Game of thrones. Let’s take a moment to remember Ned Stark – a character who literally sat front and center on the Iron Throne for GOT’s promo campaign. A man we thought was safe from the wrath of George R. R. Martin, but alas, we were mistaken. As the first of many characters to fall, it prepared us for the inevitable that is Game of Thrones. So, what can we learn from dear old dead Ned? Don’t lose your head over stress. From Lord of Winterfell to the Hand of the King, Ned’s responsibilities – and stress – skyrocketed overnight. He took on the pressure of the Seven Kingdoms and didn’t rely on anyone to help him through it. Many times in business, we take on too much in too little time. We forget to delegate responsibilities to others and quickly find ourselves on the chopping block. I’m not saying it’s impossible to take on a lot at once, but it’s best to delegate some of those tasks to others. Learn from Ned Stark’s mistake – don’t let stress be the catastrophic downfall of your company. Through intelligence and wit, Tyrion has proven time and time again that he is a force to be reckoned with. Fortunately for him, no one else believes so, making Tyrion the most disregarded character in Game of Thrones. Tyrion has taught us to work with what you have and to never underestimate yourself. During the Battle of the Blackwater when all hope had diminished, Tyrion saved the day. It wasn’t his strength or skill with a sword that won the battle, but his clever mind that brought home the W. If you find yourself subpar in certain skill sets, don’t spend your time and energy focusing on what you can’t change. Explore what makes you different and become an expert in those areas to uniquely add value to your company. This mentality will give you a competitive edge over your opponents even when all the odds are against you. Two words: Red Wedding. It makes us angry. It makes us cry. And we’re still not over the shock of killing off key characters in this gut-wrenching and heartbreaking display of betrayal. But if this episode taught us anything, it’s to know who to trust. Trust is a key component in every company, whether it involves who you hire or who you are doing business with. Choosing to surround yourself with individuals you can count on is something that needs to be a priority – just ask Robb Stark. Companies that create a culture of trust smash their competitors in every way and never have to worry about a Red Wedding of their own. RIP Grey Wind – you were an innocent direwolf in all of this. If you say you like Joffrey, then you must be joking. Not only was he an awful king, but he was one awful human as well. From beheading his betrothed’s father to fleeing his men before battle, Joffrey is the definition of a man-child. His death was the highlight of the season and he will forever be a reminder that there is a fine line between confidence and arrogance. Joffrey chose to refuse council from those around him which made it impossible for him to lead. He exuded arrogance thinking that his position as ruler of the Seven Kingdoms was a guarantee. In business, nothing is ever guaranteed. Relying on the wisdom of your team is an integral part of success. Forfeiting council can be a death sentence for your business. This season was a doozy for the Night’s Watch. The new and improved Lord Commander Jon Snow did what no other Lord Commander has ever done – invited the Free Folk to cross the wall. His decision was to save them from inevitable death by White Walkers, but his team of merry men weren’t so thrilled. Jon Snow’s men felt betrayed by his decision, so were we really surprised when they stabbed him to death? An important lesson we can learn from this is to take care of your people. Supporting your team with good benefits and fair pay will keep them loyal and motivated. When word gets out that you’re good to your employees, you’ll find amazing people vying to work with you. The last thing you want is a mutiny among your team. Oh, Jon Snow. He came to us in season one as man who would never amount to anything because of his circumstantial birth. Fast forward a few seasons and he is now King of the North and was never actually Ned Stark’s son! Jon Snow is a Targaryen, which basically has him in the running to rule the Seven Kingdoms. This moment in season six taught us that anyone can be a leader. In business, it doesn’t matter who your family is, where you grew up or where you went to school. Everyone has the capability of proving himself worthy to lead a team to greatness. Never underestimate the potential of an employee – they might be your company’s next great leader. There will be no standing ovation for Walter Frey – aka the stinky old man who was responsible for the brutal death of the Starks at the Red Wedding. We don’t see much of him anymore, but he is a prime example of why you should always finish what you started. By not killing the entirety of the Stark family, Frey became an easy target for Arya Stark to cross off her list. In business, do your job to the best of your ability and always finish what you started. Not doing so will come back to get you in the future and may play into the slow demise of your company. After Arya killed Walter Frey, she turned around and did the same to everyone associated with him. Girl knows how to finish what she started. Here at ITC, we take Game of Thrones almost as serious as the IT support we provide our clients. The experiences we’ve gained from watching GOT has provided us with the highest quality IT service while staying consistent with pricing and efficiency. For more information, you can check out our previous blog posts or visit our website to Schedule a Free IT Analysis today.